South Asia's biggest queer film festival. The biggest and first mainstream LGBTQ film festival in India. The 10th edition is to be held from June 12-16, 2019. 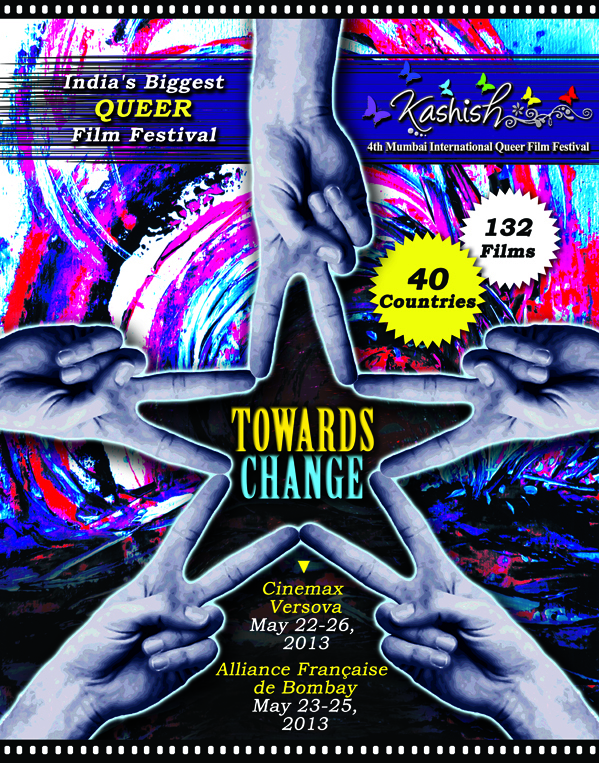 KASHISH Mumbai International Queer Film Festival is the first and only LGBTQ (lesbian, gay, bisexual, transgender, queer) film festival in India to be held in a mainstream theater, and the first LGBTQ film festival in India to receive clearance from the Ministry of Information and Broadcasting. Over the previous 9 editions, from 2010 to 2018, the festival has grown from strength to strength, attracting close to 9000 footfalls over the 4 1/2 days of the festival at two/three venues. The festival, every year, has screened from 110 films to 180 films that include shorts, documentaries, features - all centered around LGBTQ themes. KASHISH is now considered one of Mumbai's prominent cultural event and is the biggest LGBTQ film festival in South Asia. KASHISH was voted as one of the top 5 coolest LGBTQ film festivals in the world by a worldwide poll conducted by MovieMaker Magazine in 2013. After tasting success in 2012, KASHISH Mumbai International Queer Film Festival 2013 – India’s biggest LGBT film fest –is once again turning to the social media phenomenon of crowd funding to raise finances. Aimed at keeping the festival free and accessible to audiences, organisers say crowd funding also gives audience a feeling of ownership. ``Crowd funding is not just a means to raise money, but also to connect to a diverse range of people and seek their engagement with the festival,’’ says Sridhar Rangayan, Festival Director. KASHISH 2013 will be held from May 22-26 2013 at Cinemax Versova, Andheri West and from May 23-25, 2012 at Alliance Française de Bombay, Marine Lines. KASHISH is not only a festival that spotlights LGBTQ cinema, but has also become a landmark festival in Mumbai’s cultural event calendar. The festival theme this year is `Towards Change’. The festival will make a special effort to program films and have panel discussions that not only deal with LGBT themes, but also those that relate to families and friends of LGBT people. KASHISH Mumbai International Queer Film Festival is the first and only gay & lesbian film festival in India to be held in a mainstream theatre and the only queer festival to receive clearance from the Ministry of Information and Broadcasting. The festival is organized by Solaris Pictures.